Currently for Minecraft 1.7.10. No longer being updated. For a door to work as a “Portal” it needs to have a solid frame of blocks around it. Doors will link to the closest door of each type, within 256 blocks. They do not use a pairing system like was implied in the video. Rendering may have a bit of funkiness that will be seen in other situations not shown in the video. That shows how much more work will be required to make “portals” render-perfect, as well as FPS friendly. 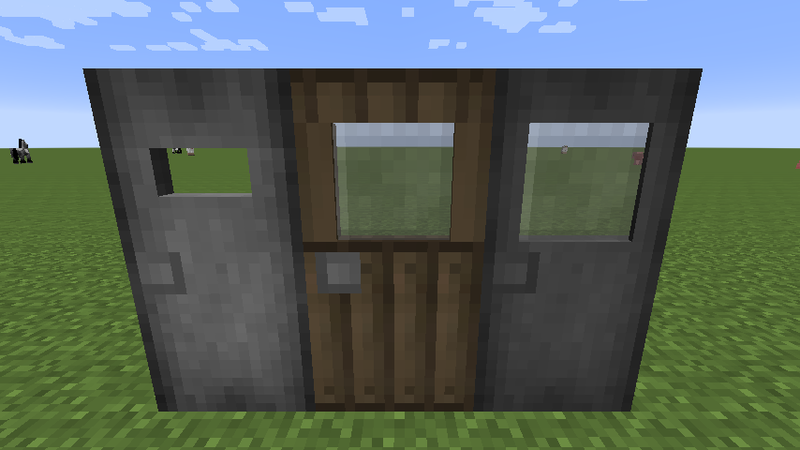 This mod adds 3 new usable doors to Minecraft. Door models made in Tabula, credit to mr_hazard, as usual! This mod is really in depth and detailed. I would do a mod review but the video would be like 2 hours long. I just downloaded, there are more details then meets the eye. Very expansive, detailed, incredible ideas and amazing, in-depth content. Before the Doors, I had to Break on Through (to the other side) every time I wanted to get in or out of my Hyacinth House. This made me an Unhappy Girl. In fact I’d Been Down So Long I gave up on Waiting for the Sun. Now Thanks to The Doors mod, I can get jnto my Soul Kitchen , Light My Fire, and get back out befroe the End of hte Night. Where is the wiki for this mod? Any eta on a 1.8 version? ^ Really? That’s your main question here? Will the portal gun mod have the same thing where you look through the portal and you see out the other portal? Well, almost the same. Basically this but with more optimisations and bug fixes. I actually kind of liked the idea that you could teleport. I can’t get it, because my driver is outdated. So sad to bad for me, I guess. Can you uhh, please update this to 1.8 along with the Portal Gun and Gravity Gun mod? I was thinking of making a map of puzzles with this. But something is skipping 1.7..
KEEP UPDATING THIS IT IS AMAZING! Can you use the rendering code to make a nether portal show the nether? CAN YOU PLEASE EITHER UPDATE THIS MOD TO 1.8 OT MAKE IT SO THAT THE PORTAL GUN MOD RENDERS THE OTHER SIDE LIKE IN OLDER VERSIONS PLEASE! Please implement the portal thing into the portal gun mod. I’d really like to be able to see through the portals. PLEASE MAKE 1.8 VERSION AND MAKE YOU ABLE TO SEE THROUGH LIKE OLD VERSIONS!!! IT WOULD BE AMAZING FOR MINECRAFT 1.8!!!!!!!!!!!!!!!!!!!!!!!!!!!!!!!!!!!!!!!!!!!!!!!!!!!!!!!!!!!!!!!!!!!!!!!!!!!!!!!!!!!!!!!!!!!!!!!!!!!!!!!!!!!!!!!!!!!!!!!!!!!!!!!!!!!!!!!!!!!!!!!!!!!!!!!!!!!!! I was talking about the Portal Gun mod. Ichun please update this mod it could be very fun and useful but it would need a frequency thing. If you are too busy or something could you find another modder to do it? It would be great if the portal render system could be implemented to make mirrors. When you update it for 1.8? For some reason the doors won’t connect to each other even though they’re both in their own solid block frames and they’re both in within 256 blocks of each other. I’ve tried using both versions of the mod and i’m not using any others besides iChun Util obviously. Help would be much appreciated. Are you using the correct version of MC? What blocks are the frames made of? Not all solid-seeming blocks are solid. I can’t get the portals to work. mod version 4.0.1. I have a suggestion for a new mod, similar to this one. It may seem like a step back, but hear me out. Dimensional Windows. Or just ‘Windows’ for short. No, not the OS. In a similar style to the Doors mod, a similar rendering style could be used, linking two windows. Ex. I place a window next to a creeper, then place another of the same type a distance away. I look through the once I just placed and see the creeper through it, despite it being very far away. Pretty little holes in the fabric of space. Since you made the Doors mod and The XCompWiz made the LookingGlass mod, which are both rather similar in functionality in my eyes, I’d suggest you exchange information on how your mods work. Not that either of your mods is flawed, but you could learn of each other’s experience and maybe even improve them to solve problems before them become apparent. Maybe you could even merge your API’s into one mod to get the best of both worlds. Please do not take this as a critique. I just really like to see multiple geniuses team up and create something awesome. ps. I have proposed the same to The XCompWiz. This would have actually been a really cool mod. Too bad it was was an April Fool’s Day mod, and won’t be updated. Is the 256 distance limit horizontal only? And is it a deliberate limit, a processing limitation, or a chunkloading limitation? Is there any way to make them work over farther distances? Maybe add a fourth door type that acts like an Iron Door as well? Dear ichun i love this mod. this mod has great rendering and much more potential than what it is used for. Please don’t let your hard work go to waste. I want to use your rendering classes in addition to the ones of Looking Glass in order to make a mod that answers all of oue dreams about crossing dimantions. Dear I Chun Was A New Doctor Who For 2015 That’s From Doctor Who From The Tardis From Doctor Who Makes It Was A Doctor Who Dosen’t The Tardis Door It’s Bigger On The Inside !!!!!! Too bad this mod won’t be updated any more, I think I found a problem. Seems the same doors in different chunks won’t connect, despite being close enough. Hey. I made the frames around the doors and everything and used the same kind of doors but they are not making portals. does the frame matter? Is there a way to remove the black border around the portals? I want to use this mod to make building bigger on the inside, but I don’t want to be able to notice it. I’m playing this years after it came out (Minecraft version 1.12.2 at the moment) and it’s nowhere near April fools right now. I was thinking to myself “hmmm this looks like a pretty cool mod, I should try it”. so I log on to minecraft, get all the doors from my inventory, and see a village nearby. I decide to change all the doors in the village to the stone ones without glass. so I’m walking through the doors and suddenly, one house leads to another house and I have to break through the walls to get out… I’m thinking to myself “what the crap is going on here” so I try it with different houses and eventually get myself caught up in an infinite loop. overall, I was confused as crap until I figured out it was an April fools joke.